When a nation’s purple XP bar (in the upper left corner of the screen) fills up, the nation has earned enough XP to advance to the next level. When this happens the nation will gain a reward in credits, as well as an Advance Point. An Advance Point can be spent to research one of hundreds of different advances, that each make a nation more powerful. If a nation has any unspent Advance Points, their count will appear in a yellow Advance Points bar at the top of the screen. To research an advance, open the Advances panel. The Advances panel has two different options for viewing available advances: a list view and a tree view. You can swap between these views by pressing the button in the upper right corner of the panel, to the left of the close button (X). 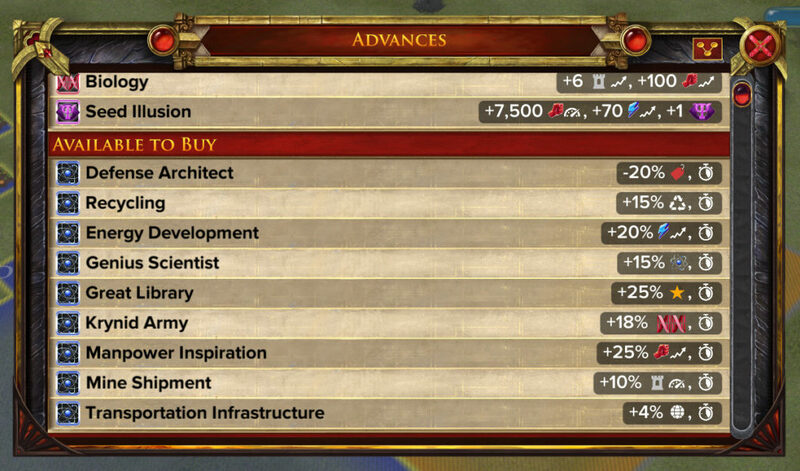 The list view shows a list of all advances available in War of Conquest, organized into groups. The first group is the list of advances that your nation currently has available to be researched. Click (or tap) on any advance in this group to view an info panel with a summary of the advance and a list of any stat bonuses or special abilities it grants, or defenses that it makes available to build. 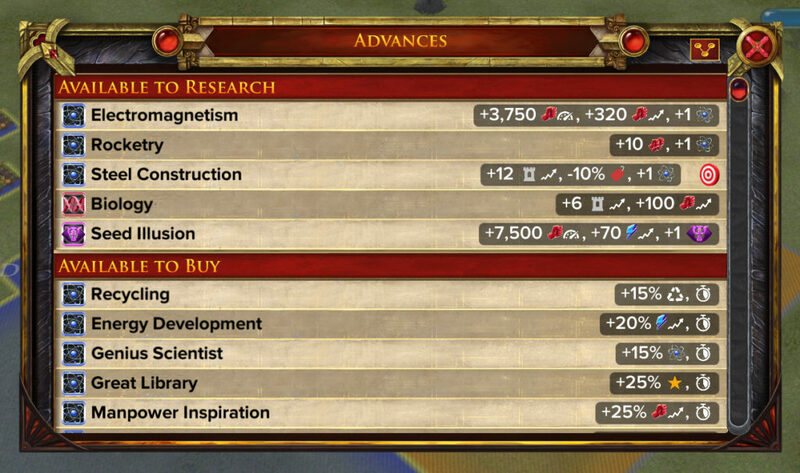 The info panel will also include a “Research” button that allows you to spend one Advance Point (if your nation has one) to research this advance. Every line in the list view also has a series of icons that give a quick summary of all the bonuses provided by that advance. The next group in the list view are those advances that are available to be bought by spending credits, the in-game currency. Each nation starts with some credits, and there are many different ways to gain more by playing the game. Credits can also be purchased (see Buying Credits). To buy one of these advances, click (or tap) on its line and press the “Buy” button. After this are listed those advances that are not yet available to be researched, and those that are not yet available to be bought, because their requirements haven’t yet been met. Most advances require that several more basic advances are researched before they can be obtained; for example, Electronics will need to be researched before Elementary Computer becomes available. Some advances also require that a nation attain a certain level before they can be researched or bought. Finally, the advances that the nation has already researched, and those that it has already bought (and that are still active) are listed at the end. Some advances that can be bought are temporary advances (“temps”) that expire after a number of minutes or hours. When your nation has any temps active, a list of icons representing each active temp will appear, running down the left side of the screen. You can click on these icons to view information about the temporary advance, including how long until it expires. The list view of the Advances panel also makes it possible to set a “target” advance that you want your nation to work toward. 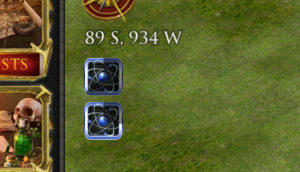 It will then display a small target icon on the line of each advance that is required to get to that target. This makes it easy to find all the requirements when working toward a research goal. To set a target, click (or tap) on one of the advances in the “Not Yet Available to Research” or the “Not Yet Available to Buy” section, and press the “Set as Target” button in the info panel for that advance. The tree view of the Advances panel shows the same information as the list view, but in a different form. In the tree view, advances are arranged into a sprawling tree, where the basic advances are at the bottom and later advances are at the top. Advances in this tree are connected by lines that show which prior advances are required before a later advance can be researched. The advances tree is broken up into three sub-trees, for advances associated with the three combat stats: Tech, Bio and Psi. 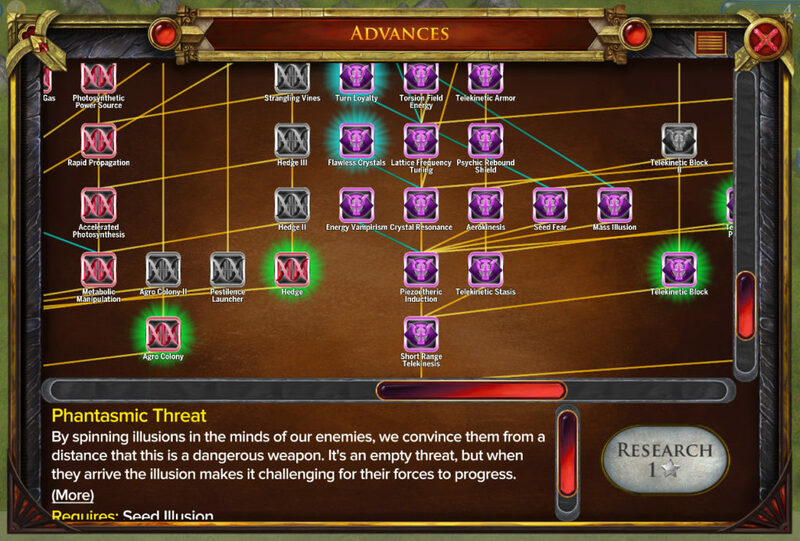 You may choose to have your nation specialize in advances from one or two of these sub-trees, or to balance between the three of them (see The Combat Stats). Advances your nation has already developed show up in color; advances your nation has available to research are surrounded by a green glow, while advances that are available to be purchased have an aqua glow. Advances that are not yet available to be researched or purchased because their requirements haven’t been met appear grayed out. Click and drag (or press and swipe) to scroll around the large tree of advances. Use the scroll wheel or the up and down arrow keys (or pinch and zoom on mobile) to zoom in and out. When you click (or tap) on the icon for an advance in the tree view, information about the advance will appear at the bottom of the panel. You can press on the links in the description to view info about related advances or defense structures. 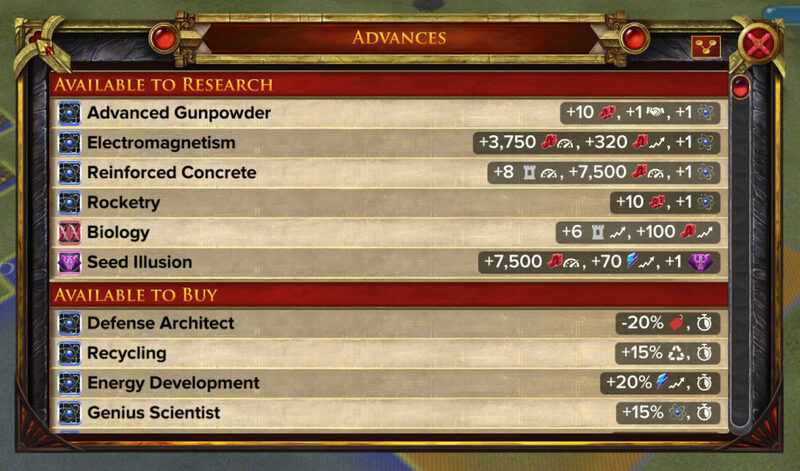 If the advance is available to your nation, a “Research” or “Buy” button will also show up in this bottom area.